Five Sun employees are among eight people arrested over alleged corrupt payments to police and public servants. The BBC understands picture editor John Edwards, chief reporter John Kay, chief foreign correspondent Nick Parker, reporter John Sturgis and associate editor Geoff Webster were arrested. News International told staff Rupert Murdoch was committed to the paper. The arrests are part of the Operation Elveden probe into payments to police. But the latest arrests mark a widening out of the operation to include the investigation of evidence in relation to suspected corruption involving public officials who are not police officers. "You should know that I have had a personal assurance today from Rupert Murdoch about his total commitment to continue to own and publish The Sun newspaper." He also told staff that "today we are facing our greatest challenge" following the arrests of five of its staff, which was "difficult for everyone on The Sun and particularly for those of you who work closely with those involved". BBC News correspondent Joe Lynam said Sun employees he had spoken to were concerned there was something of a "witch-hunt". Sun editor Dominic Mohan said: "I'm as shocked as anyone by today's arrests but am determined to lead the Sun through these difficult times. 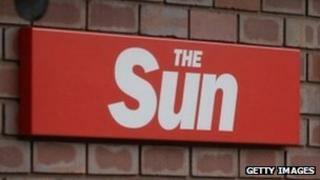 News Corporation confirmed five employees of the Sun were arrested. A 39-year-old serving Surrey Police officer, a 39-year-old Ministry of Defence employee and a 36-year-old member of the armed forces were also arrested at their homes on suspicion of corruption, misconduct in a public office and conspiracy in relation to both. Two were arrested in Wiltshire and one in Surrey. Those arrested are being questioned at police stations in London, Kent, Essex and Wiltshire, police said. The homes of those arrested were being searched and officers were also carrying out searches at the offices of News International in Wapping, east London. The company said in a statement: "News Corporation remains committed to ensuring that unacceptable news-gathering practices by individuals in the past will not be repeated and last summer authorised the MSC to co-operate with the relevant authorities. "The MSC will continue to ensure that all appropriate steps are taken to protect legitimate journalistic privilege and sources, private or personal information and legal privilege. "News Corporation maintains its total support to the ongoing work of the MSC and is committed to making certain that legitimate journalism is vigorously pursued in both the public interest and in full compliance with the law." A Ministry of Defence spokeswoman said: "We do not comment on ongoing investigations." A Surrey Police spokesman said on learning about the involvement of one of its officers it had immediately referred the matter to the IPCC. Assistant Chief Constable Jerry Kirkby said: "The force takes matters of this nature extremely seriously and we will not hesitate to respond robustly to allegations where there is evidence to support them." Deborah Glass, IPCC deputy chairman, said: "Today's arrests are further evidence of the strenuous efforts being undertaken to identify police officers who may have taken corrupt payments." The Surrey Police officer arrest is not connected to the Milly Dowler investigation. Last week the Independent Police Complaints Commission cleared another Surrey police officer of leaking information to the press about the Dowler investigation. BBC home affairs correspondent Danny Shaw said the information on which police appear to be making arrests is based on a database of 300 million emails dating back at least seven years. Media commentator Roy Greenslade told the BBC he was "shocked" by the arrests of the Sun journalists. Asked whether the Sun was heading towards being closed down, as the News of the World had been, he said: "There are reports that Rupert Murdoch is flying in to quell suggestions of closure. "You must realise that the Sun has a very large staff and none of the production journalists are affected by this, so there's no question of it not coming out. "As for closure, I think that may be on the cards at some stage in the future but right now, clearly, it isn't." The arrested journalists were former deputy editor Fergus Shanahan, former managing editor Graham Dudman, crime editor Mike Sullivan and head of news Chris Pharo, the BBC understands. The remit of Operation Elveden has widened to include the investigation of evidence uncovered in relation to suspected corruption involving public officials who are not police officers. Operation Elveden is being overseen by the IPCC, running alongside the Metropolitan Police's Operation Weeting inquiry into phone hacking at the now-closed News of the World. More than 20 arrests have so far been made as part of Operation Elveden.